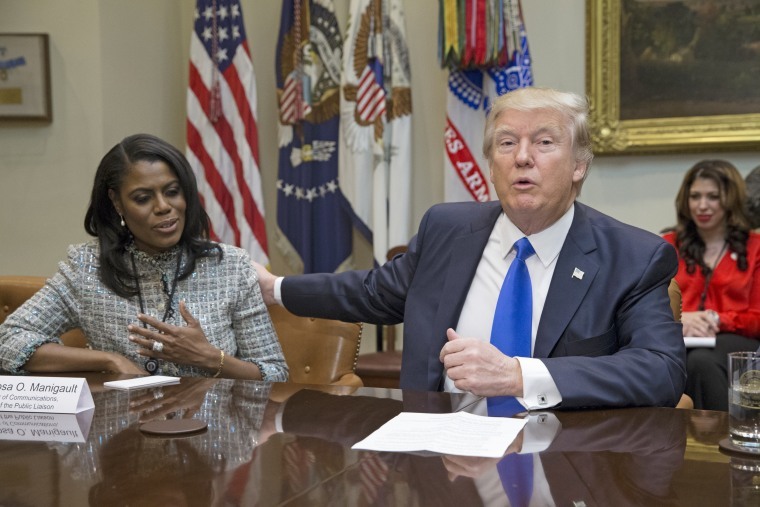 WASHINGTON — Omarosa Manigault Newman knew she stood out in this White House. "I'm the only African-American woman who sits at the table," the former "Apprentice" contestant and departing White House senior staffer said in an interview Thursday morning. Wednesday's announcement that the controversial aide was leaving her White House post has brought with it new questions about diversity — or lack of it — in the Trump White House. In the ABC interview, Newman referred to herself as "the only African-American woman in this White House," adding that she had "quite a story to tell" in the future about her time in an administration that has struggled with racial issues and outreach to minority communities. That she's the only African-American woman at a senior level in the White House is not a stretch of the truth. Newman, along with Housing and Urban Development Secretary Ben Carson, were the only black voices among more than 30 Cabinet secretaries and senior staff members around President Donald Trump. Though the position is not Cabinet level, Surgeon General Jerome Adams, an African-American, has been serving since September. In a second interview with ABC, Newman pointed to a "lack of diversity" in the administration, calling it "very, very challenging being the only African-American woman in the senior staff" and even admitting it "was very lonely" working with a predominantly white staff who "had never worked with minorities, didn't know how to interact with them." Asked by NBC News on Thursday how many black senior staffers remained at the White House in the wake of Newman's departure, Press Secretary Sarah Huckabee Sanders declined to cite a number or specify who would take over Newman's outreach to African-American communities. "We have a really diverse team across the board at the White House," she said, stressing that there's also an effort to "continue to grow the diversity here" in the administration. As for outreach efforts to minorities, Sanders noted that there are voices, including Carson's, who play a role, but that Trump has also relied on some outside the White House. "The president met with Senator Tim Scott," Sanders said, referring to the South Carolina Republican. "I know he wants to continue those conversations as well to look at the best ways to do that and to do outreach to that community." The president himself told reporters Thursday afternoon that he liked Omarosa, but ignored a question about how many African-Americans he had in his inner circle. Meanwhile, Newman said Thursday that the question of who would fill the void she left is one best asked of Trump and his chief of staff, John Kelly, whom she clashed with during her time in the White House. Despite statements that the White House is "really diverse," a June release of staff salaries showed that Newman was the only African-American at the top rung of the salary scale. And while women have seen their profiles raised in this administration, including Communications Director Hope Hicks and Sanders, there are few staffers of color in high-level jobs. An NBC News review found only a small percentage of nonwhite staffers were appointed as assistants to the president or special assistants to the president. The White House did not respond to a request for comment on these findings. Last week, former White House strategist Steve Bannon, at a gathering of black conservative leaders, called out the administration that he was once part of for what he cited as a lack of diversity, saying the limited number of black staffers was "inexcusable." "You can't defend it," Bannon said, adding later, "I hope, and I think, that there's action ... taking place to solve that." The president repeatedly pitched himself as a friend to African-American voters during the campaign, asking at several rallies what they had to lose after voting for Democrats and not seeing any changes. In office, he has repeatedly inflamed race relations with his comments. After a white supremacist rally in Charlottesville, Virginia, turned into a violent clash in August, leaving one person dead, Trump blamed "both sides." "There are two sides to a story. I thought what took place was a horrible moment for the country, but there are two sides to a story," the president said. Trump's comments sparked swift criticism from lawmakers of both parties, and even members of his own administration. Publicly, Newman was not one of them, and throughout her White House tenure she had a rocky relationship with black community leaders and activists. Thursday morning she spoke cryptically about "a lot of things" she saw while in the service of the president —but in the second interview defended Trump, saying "he is not a racist" despite past missteps. "Yes, I will acknowledge many of the exchanges, particularly in the last six months, have been racially charged,” Newman told ABC. “Do we then just stop and label him as a racist? No." "As the only African-American woman in this White House, as a senior staff, and assistant to the president, I have seen things that have made me uncomfortable, that have upset me, that have affected me deeply and emotionally, that has affected my community and my people," she said.